Gov. Rick Snyder signs the 2011-2012 budget as Republican lawmakers look on. The governor is banking on $145 million in concessions from state employee unions as part of that budget. State workers are scheduled to rally in Detroit tomorrow to protest wage and benefit cuts. 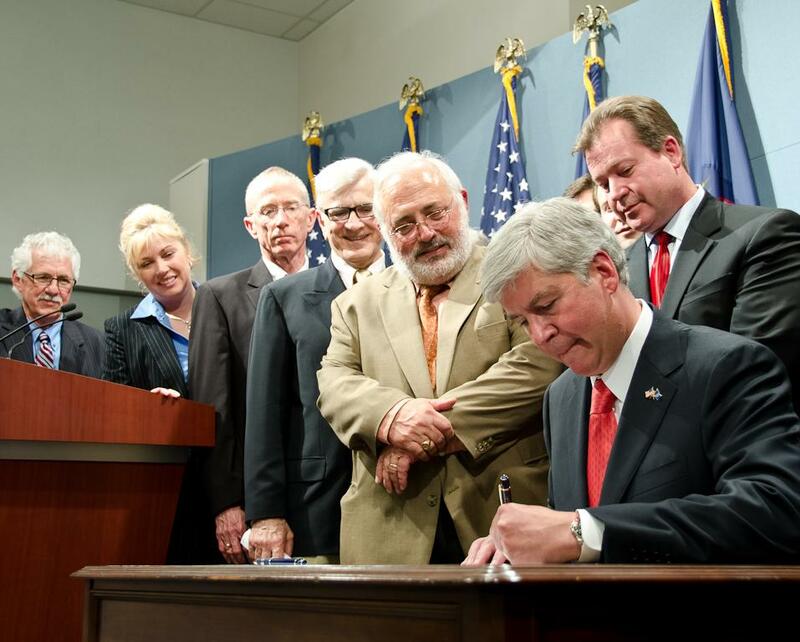 Governor Snyder is seeking $145 million in concessions from state employees for the fiscal year that starts in October. An official with one of the largest state employee unions, Ray Holman of UAW Local 6000, says over the last decade the state has shed more than 12,000 positions. "And what that means for the average, for example, Department of Human Services caseworker, is they may have 700 to 1,000 families they’re responsible for." A spokeswoman for Governor Snyder says while the number of employees has dropped over the decade, employee compensation has gone up 38 percent in that same period. She says concessions are necessary to make the state budget sustainable.